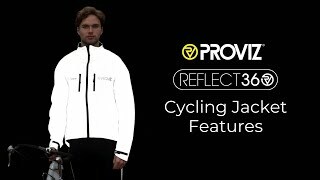 The Proviz REFLECT360 Reflective Jacket is the world's first to be designed for cyclists and is taking reflectivity and cyclist's safety to a new level. The whole jacket is manufactured from 100% reflective material giving 360 degree visibility to ensure cyclists are seen from every angle. The jacket's high quality reflective material picks up and reflects the slightest of light to help drivers easily identify a cyclists position on the road from the greatest distance possible giving them more time to react and manoeuvre appropriately. The REFLECT360 jacket incorporates multiple vents - front, shoulder/back and under arm. This allows the user to regulate body temperature. By opening the front zipped vents a 'through-flow' is achieved. The air enters the front vents, cools the body and exits via the shoulder/back vents. During the winter, the vents can be closed and are designed to also be used as extra pockets if required. These features enable the jacket to be used all year round. The jacket also has an inside chest pocket and large lower back pocket to add extra layers or a map. Using the REFLECT360 cycling jacket at night will also give you the extra benefit of being able to be clearly visible when signalling which way you wish to travel. When holding out an arm to indicate you wish to manoeuvre in a certain direction, your arm acts as a clear and highly visible signal to drivers.